The 2015 UK elections are approaching and people are trying to decide who they'll vote for. One way to find out which party represents our ideas is to do a quiz. One which looks quite comprehensive is The Political Compass. The Political Compass profile of the various political parties (in several countries now) gives us a pretty good idea of where they stand. The LibDems have drifted back into their original lower-right quadrant. 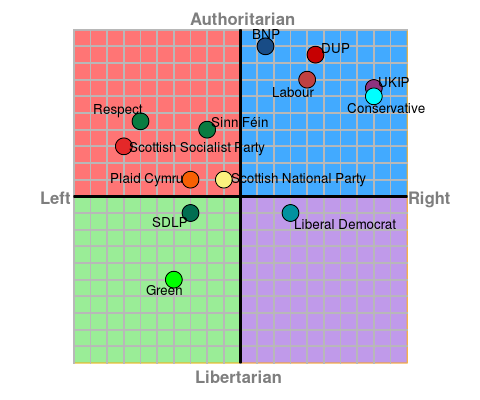 Tories are towards the right of their usual territory (probably influenced by UKIP who are the most right party - note the comparison with the BNP who are centrist-authoritarian). The author of this blog is to the left of and on the same vertical level as the Greens. Take the Political Compass test.